Another year has rolled by. Can't believe how fast they go! And with that, it's time to reserve your room for the Lone Star AudioFest. The reservation links for LSAF 2019 are online and ready to use at the LoneStarAudiofest.com website. Hi Wayne, Maybe....if we can get some chassis made. Lack of them has severely hurt our ability to do business. Rodney had to move everything as well to a new location and now everything is in boxes. That must be a vintage photo as the preamp and amps are here with me and BTW work just fine. I am using a quad of "Oddwatts" right now with two for subs and two for the mains. Passive volume and selection preamp, all tube phono preamps and an active electronic crossover between the amps. A little "sand" doesn't seem to hurt the sound any. Hope to see you there, Bruce! 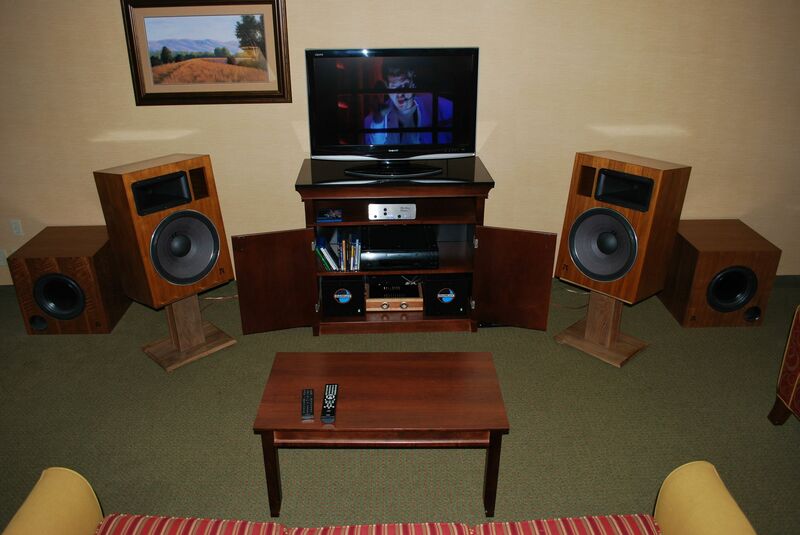 And - Yes - That's an LSAF 2013 photo of the π Speakers room where I was running your amplifiers. OK, I'm all signed up and official. Once again my room won't be on the same floor as the show as the flight, hotel and car all got booked together and that puts me on another floor. It's OK as it's dramatically less expensive to book everything together. There isn't any mention of seminars this time around so are they off the table this year? Looking forward to the show. And BBQ. And chicken. I didn't reach out to anyone about seminars this year, nor did I ask for a conference room. I did that the first couple of years in Tulsa, and also early on in Dallas. But after the second or third year, I started making it an every-other-year or every-third-year thing. You know how it is though: It's not at all unlikely that an impassioned vendor will have what amounts to an impromptu seminar in their room. Keith Larson tends to do that when he comes, because he is an expert in acoustic measurements and that makes his room lively with academic discussions as opposed to listening. Some of the other vendors are like that too. I can definitely see someone get on a roll about multisubs and room acoustics or some other such thing. I love that poster. Remember when Maxell used it for their magazine ads? Yeah, I remember. That poster sold a boat load of cassettes. Looking forward to LSAF! Flying in Friday and leaving Saturday...should be a good time.